Does Everyone Need a Programmable Thermostat? If you’re someone who loves having the latest and greatest tech then you absolutely need a programmable thermostat. On the other hand, if you’re someone who prefers proven, established and dependable products with a long track record over newer fancy gadgets and gizmos, well then, you also need a programmable thermostat. And yes, if you haven’t figured it out yet, we are recommending that early adopters, later adopters and everyone in between should have one of these devices for their homes, since they can help you sync your HVAC system to coincide with your daily schedule, and in the process, help you use energy wisely and ultimately save you money. How much money? There is an actual answer beyond the vague “some” you may get from some manufacturers asking you to upgrade to a certain product. EnergyStar, a coalition funded by the U.S. Department of Energy and the U.S. Environmental Protection Agency that encourages energy savings, estimates that the typical U.S. homeowner can save up to $180 a year on energy costs by switching to a programmable thermostat and generally following the pre-programmed settings. They’re not overly expensive, and don’t take a lot of time to install, although it is recommended that you seek professional help to make sure it is done correctly. However, two arguments against them are that that they’re too new of a product and they can be complicated. 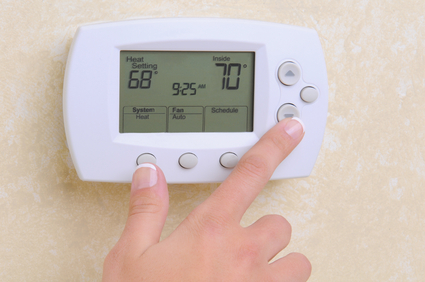 The truth is that programmable thermostats have been around in some form since the late 1800s. ProThermostats.com’s history section said Honeywell created an automatic fireplace flapper in 1885, which opened and closed at certain temperatures. The company continued to create variations on this concept, such as devices that you wind up at night and they produce heat until morning. Toward the end of the 20th century, systems began to become more advanced and allowed the homeowner to precisely choose when the heating or cooling system would activate. Today’s devices are all digital, but still have the same principle – you pick at what time or temperature you want the cool air, hot air, or fan to turn on or off. It’s easy to change the settings, even just until the next cycle if variations are needed. For instance, you may want the daytime temperature a little warmer on days when you work at home or are home sick, or an unseasonably warm day can require you to make the AC turn on a little earlier. Some thermostats even allow you to set different schedules for different days – if you like to sleep late on Saturdays but not on Tuesdays, you can adjust accordingly. Some “5-1-1” models even allow different settings for weekdays, Saturdays and Sundays. The computerized ‘dashboard’ may be a little confusing to those used to traditional on-off thermostats. All of them come with instruction manuals but what may be more useful is having the HVAC tech who installs it show the basics, or tell the homeowner that they’ll be available for future questions.